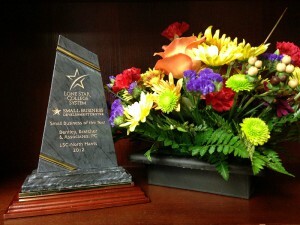 HOUSTON (Sept. 26, 2012) – The Lone Star College System Small Business Development Center Advisory Council has selected 18 finalists for its 26th Annual Small Business of the Year awards. Each year, members of the LSCS SBDC Advisory Council select and recognize successful small businesses that make an impact in the local community and on the economy. Nominees were gathered from the community and 18 finalists were selected, three finalists from each of the six college service areas, on the basis of leadership, entrepreneurial spirit, business growth, and contribution to the community. All 18 finalists are first recognized at a luncheon on Oct. 17 and then the winners – one from each of the six college service areas – will be recognized at the 2012 26th Annual Small Business of the Year awards banquet on Nov. 15. The 2012 26th Annual Small Business of the Year finalists are: from LSC-CyFair – Texas Security Shredding, Patricia Vice; Pro Line Supply Company, Darlene Hajduk; Texas Emergency Care Center, CFM Interests, Ltd.; from LSC-Kingwood – Shank Wealth Management, Bill Shank and Christian Shank; Beckwith’s Car Care, Lynn Beckwith; Kennedy Fabricating, Inc., Kevin Kennedy and Jeremy Want; from LSC-Montgomery – Karlins, Ramey & Tompkins, Mike Karlins, Jay Tompkins and Glea Ramey; The Woodlands Young Learners Academy, Debbie Kaschik and Dan Altom; Martin & Stilwell, LLP, Michael Martin and James Stilwell; from LSC-North Harris – Entelrgy, LLC, Cynthia Soto; Salon Matos, Rosie Matos and Sandy Matos; Bentley, Bratcher & Associates, Gregory Bratcher, Bill Pilkington and David Hardy ; from LSC-Tomball – Texas Blue Springs Distributors, Richard Graham; Inline Services Inc., Gary Smith; Northrock Technical Services, Summer Perkins and Mike Perkins; and from LSC-University Park – Register Real Estate Advisors, Shannon Michele Register; Molen & Associates, Ward Molen and Crystal Molen; Westpark Communications, LP, Kathie Edwards. The 26th annual awards banquet will be held Thursday, Nov. 15 at The Woodlands Waterway Marriott. For tickets or more information about the banquet, call the SBDC at 832.813.6674.